MadgeTech is proud to be exhibiting at the New Hampshire Aerospace and Defense 2016 Conference on June first. This show brings together top aerospace industry leaders to learn about market trends and connect with other industry professionals. MadgeTech will be showcasing its line of data logging products, all of which are designed, engineered, and manufactured in Warner, New Hampshire at the MadgeTech headquarters. With products sold in more than 100 countries around the world, MadgeTech is known to provide reliable monitoring solutions trusted by government agencies, including NASA. In 2012, NASA strategically set up 17 RHTemp101A MadgeTech data loggers around its Vehicle Assembly Building inside the Kennedy Space Center in Florida. The loggers recorded the temperature and humidity of the building for one year to demonstrate temperature differentials that could impact the launch of the spacecraft. Often used for research, development, testing and studies, MadgeTech data loggers monitor and record shock, temperature, voltage, pressure and humidity. The collected data provides a complete environmental profile which can be used to ensure aircraft component reliability during operation and storage, as well as monitoring engine functionality. MadgeTech also makes it easy to compile reports and analyze recorded data with easy to use, Windows-based software. The MadgeTech 4 Data Logger Software is equipped with a variety of customizable features and reporting capabilities making it simple to examine, export and print reports with the just the click of button. MadgeTech’s strength in the aerospace and defense sector is attributed to product reliability and a diverse selection of data logging solutions to accommodate clients with a wide variety of application needs. MadgeTech’s knowledgeable and technical sales engineers are available to assist with selecting the right devices and solutions for the task. Services such as on-site validation, including IQ/OQ/PQ protocol and installations are also available as needed. A MadgeTech certified operator or sales engineer will not only help install and validate the data logging system, but also assist in providing a comprehensive final report for even the strictest regulatory agencies. For facilities that require continuous wireless monitoring MadgeTech offers a wide selection of wireless data loggers including the 2000A series. All MadgeTech wireless loggers are compatible with MadgeTech Cloud Services which allows users to monitor real-time data remotely from any smartphone or internet enabled device. This system can be set up to first send data to a central PC within the location and then instantly on to the cloud, or configured using the new RFC1000 Cloud Relay to transmit directly to the cloud via Ethernet connection with no PC required. Affordable and flexible, this system is designed to fit the needs of a single logger application or scalable to accommodate hundreds of loggers in multiple locations around the world. MadgeTech also provides ongoing service and maintenance of devices including calibration certificates from the MadgeTech Lab. To ensure device accuracy and compliance, annual data logger calibration is recommended for the life span of the device. 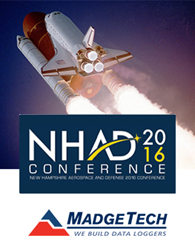 To view MadgeTech’s selection of data loggers for aerospace related applications, click here, or stop by the New Hampshire Aerospace and Defense 2016 Conference Wednesday, June 1st from 8:00 a.m. to 4:00 p.m. at the Radisson Hotel in downtown Manchester to speak directly with a MadgeTech technical sales representative.